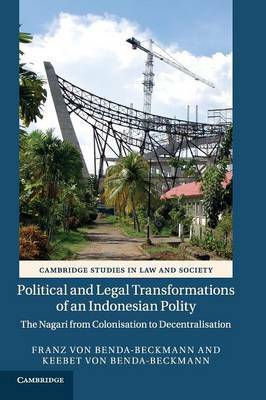 Political and Legal Transformations of an Indonesian Polity is a long-term study of the historical transformations of the Minangkabau polity of nagari, property relations and the ever-changing dynamic relationships between Minangkabau matrilineal adat law, Islamic law and state law. While the focus is on the period since the fall of President Suharto in 1998, the book charts a long history of political and legal transformations before and after Indonesia's independence, in which the continuities are as notable as the changes. It also throws light on the transnational processes through which legal and political ideas spread and acquire new meanings. The multi-temporal historical approach adopted is also relevant to the more general discussions of the relationship between anthropology and history, the creation of customary law, identity construction, and the anthropology of colonialism.